This reminds me of "moss grows fat on a rolling stone" from American Pie! Stupid...I know! But he sure is cute! 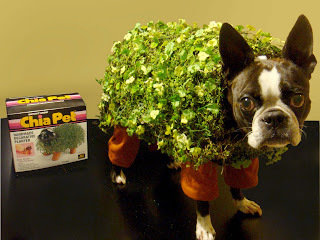 That's so funny :) I think Echo is so precious and really could pass as a chia pet. How very creative. He so looks lika a Chiapet. heehee. Love it!! But this really is creative and a great picture. Echo, is growing on me. Such a creative costume! Good luck! Wonderful! I love the creativity and the great sense of humor.